Or Roofmates actually, these work maidens. Pictured on the roof terrace here but also happily applying cement and drilling holes on a sloping roof, bringing some female energy to the fine arts of construction. We are working in teams of two now. 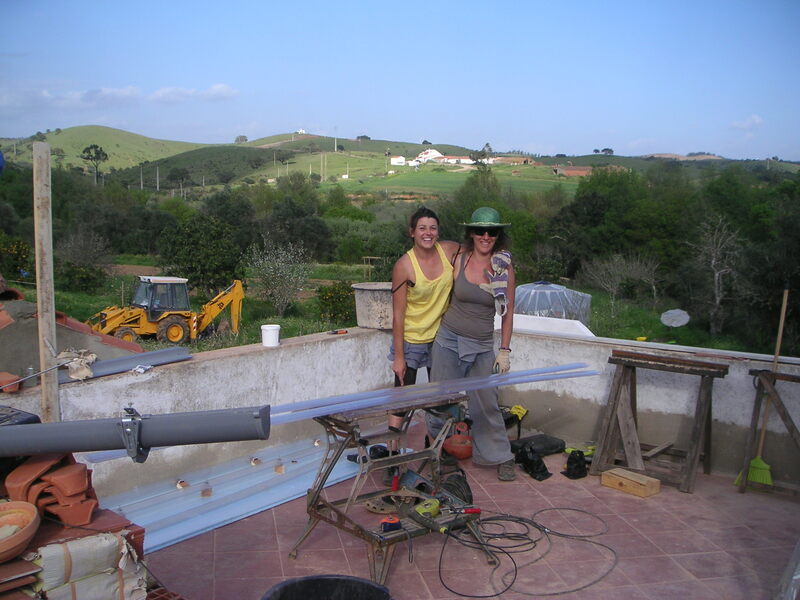 Andreia and Jaime were finishing the ridge of the barn roof today, Patricia and I are mounting the transparent sheets on the solar collector box. 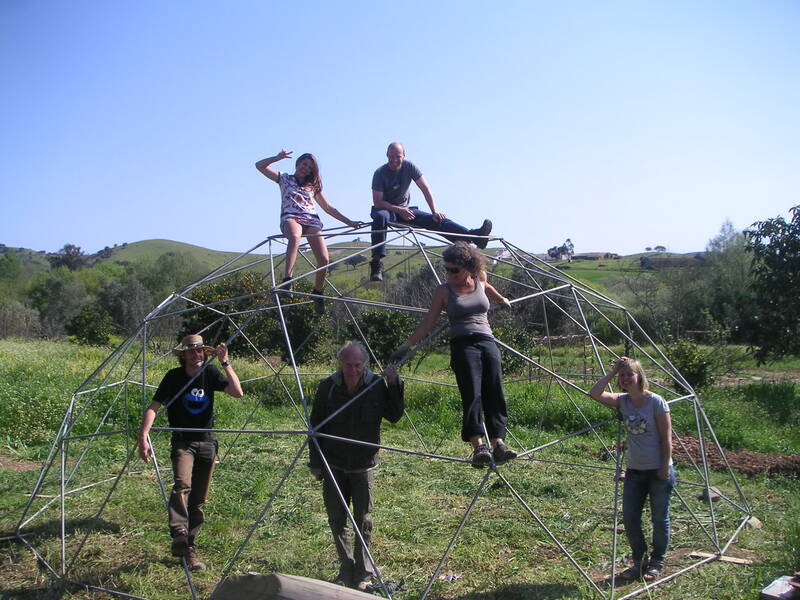 A new, larger dome structure was assembled yesterday. For Enn it was the last project of his volunteering holiday as he is travelling back to Estonia today. 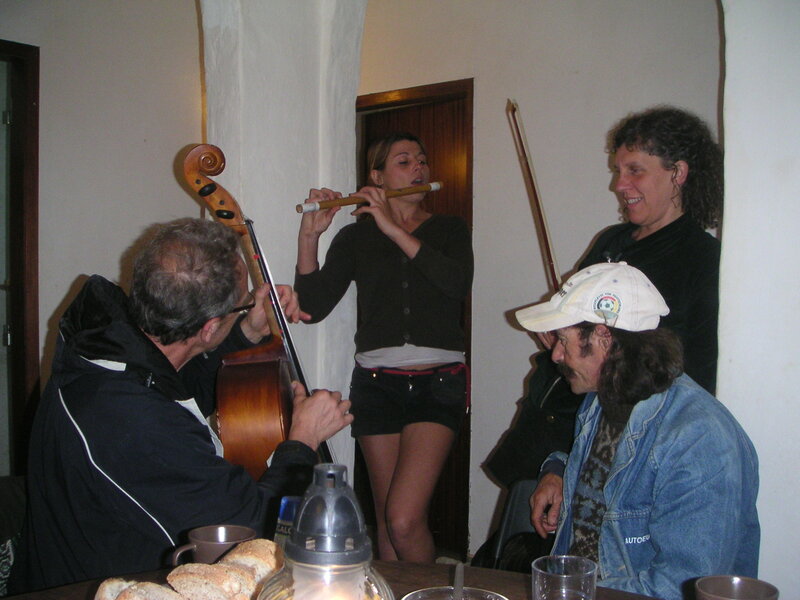 The night before we were singing and making music again with Ananda. For all of you who could not be here we were singing: So close, no matter how far / couldn’t be much more from the heart / Forever trusting who we are / and nothing else matters (lyrics by Metallica). “In times of trouble”, sing the Beatles, “there will be an answer, let it be, let it be”. I guess you know the song. “I wake up to the sound of music, mother Mary comes to me, speaking words of wisdom, let it be”. 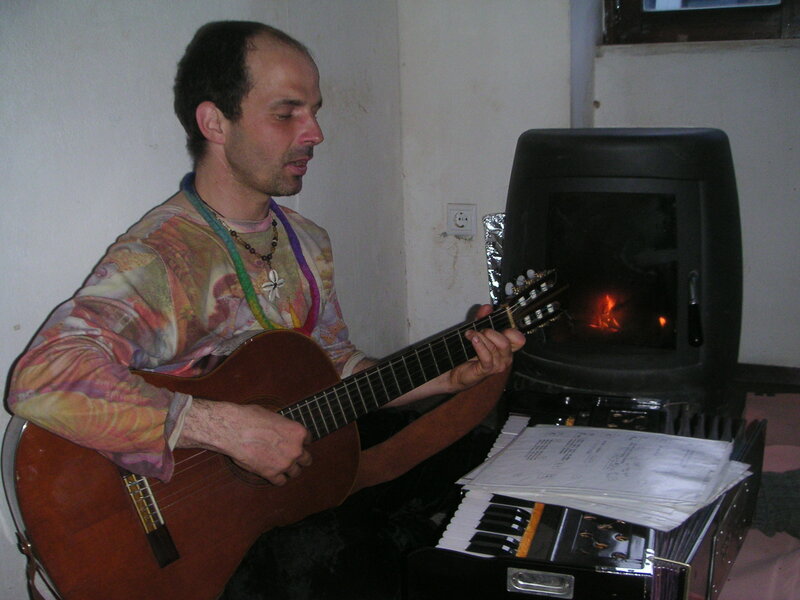 We will be singing Ananda’s words and you are invited at 6 pm Sunday 20th March. 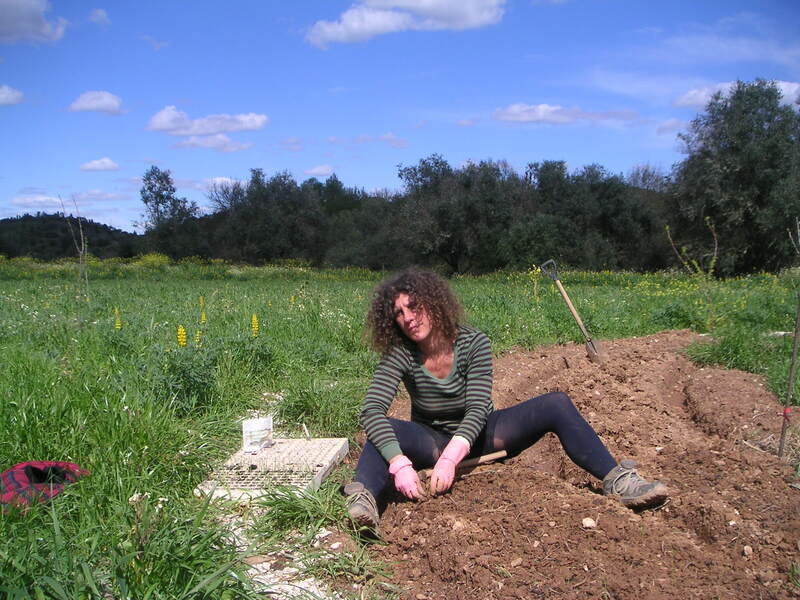 We celebrate the spring, the rains are gone, work in the garden has resumed and yesterday Patricia from Madrid joined us. Farmers troubles. Right now the big question is when the last night frost will be. No one knows so you must guess when you can safely plant outside. Guess it wrong and you can start all over again. Or call the Reiki masters :–) The frozen tomato plants looked hopeless but now grow new buds in place of the dead leaves. 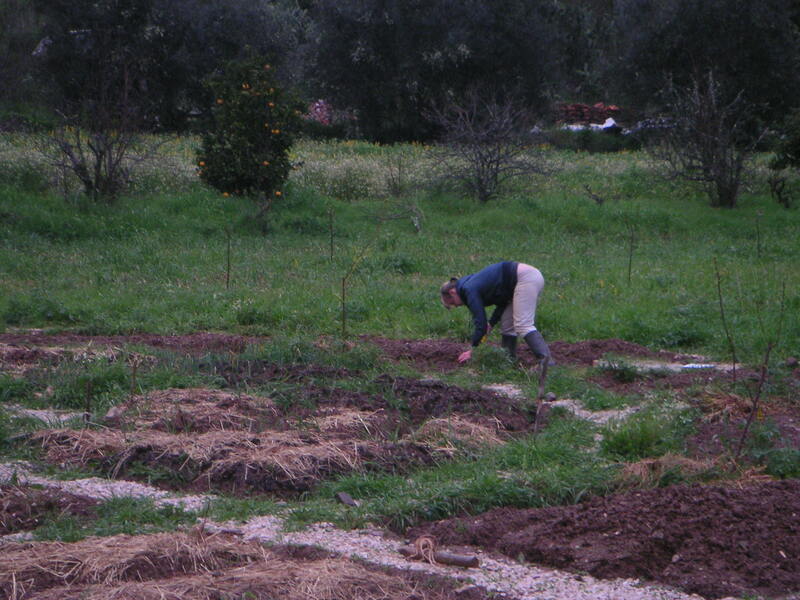 Meanwhile Eliza is digging irrigation channels and planting onions out today. They can better tolerate frost. These days people enjoy parading in extravagant costumes and disguises. In the animal world some species use disguise or mimicry as a survival strategy. 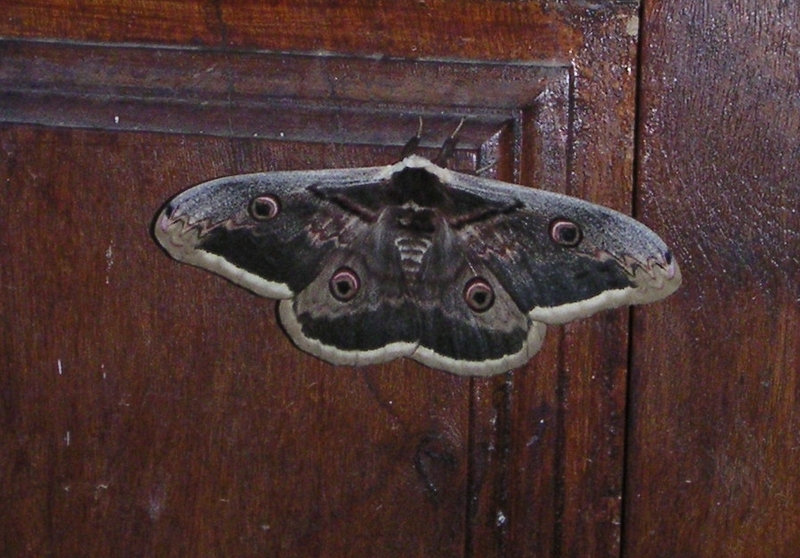 This enormous butterfly, with a wingspan of 14 cm, was watching us from the kitchen door with designs on its wings portraying four eyes and an approaching bird of prey. Frightening! Does anyone know the name of this species?